Mr Marco da Vinha, author of the blog Alma Bracarense about the Use of Braga, sent in some pictures of asterisks from three different Portuguese cathedrals, Braga, Lisbon, and Bragança. 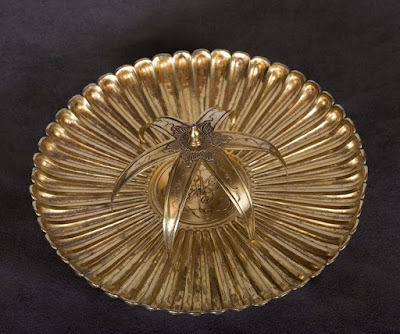 In the Byzantine Rite, the asterisk, the “little star”, is a collapsible stand which is used to hold up the veil that covers the diskos (paten), so that the veil itself does not touch the Prosphora, or “Lamb”, the bread which has been prepared for consecration. 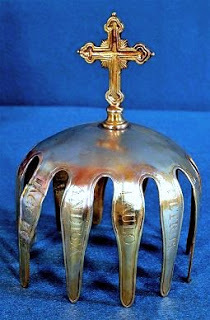 The article about it in the old Catholic Encyclopdia is not quite correct when it states that it “is not used in the Roman Rite at all.” A version of it, which is called an asterisk, although it does not close like the Byzantine one, was used at the old Papal Mass for the Pope’s communion of the Sacred Host, which the assistant bishop brought to him at the throne on a veiled plate, with the veil supported by an asterisk. It would appear that the use of it was granted to Lisbon, along with various other privileges, when that See was raised to the status of a Patriarchate in 1716, and from there passed to other Sees. All three of these were made in the 18th century. 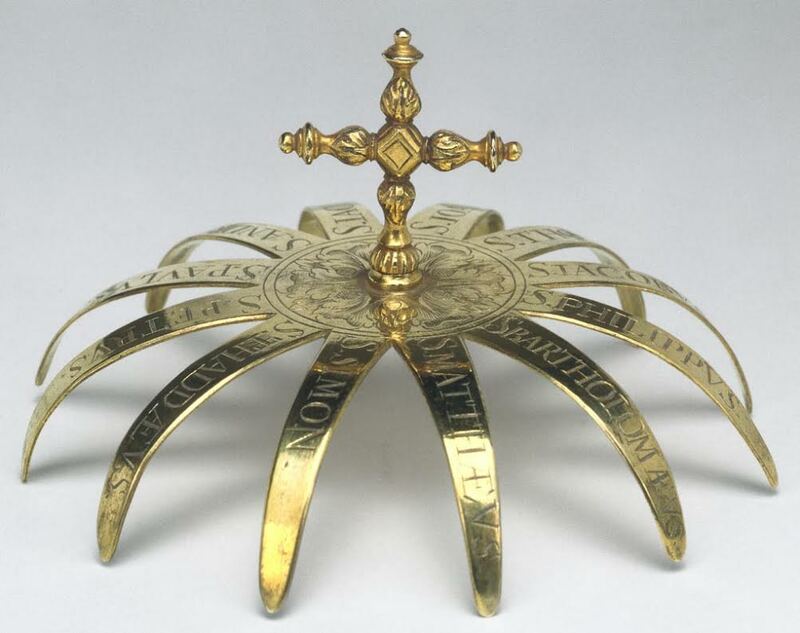 The first, which has only six points, is from Braga; the second is from Lisbon, the third from Bragança, and like the Papal one, they have twelve points, each of which is inscribed with the name of one of the twelve Apostles. 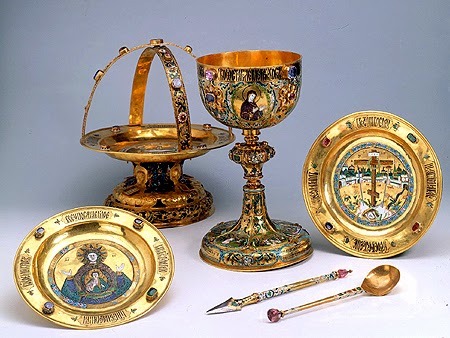 In this set of vessels and instruments for the Byzantine Liturgy made in Moscow in 1679, now in the treasury of the Hermitage Museum in St Petersburg, the asterisk is seen standing on the diskos at the back left. During the office of preparation, when it is time to incense the gifts, the priest touches the folded asterisk to the thurible, then opens it and places on the diskos, over the Lamb and the various particles which are on it, saying, “The star came and stood over the place where the Child lay with Mary, His Mother.” For this reason, many of them have a small star hanging from a small chain in the middle. The veils are removed before the Preface dialog, but the asterisk is left in its place; at the last words of the Preface, the deacon takes the asterisk, and knocks it lightly against the diskos at the four cardinal points, as the priest sings “singing the triumphal hymn, shouting, crying aloud, and saying.” (In some traditions, he also knocks it lightly against the chalice three times at the words “Holy, Holy Holy!”) He then folds it, presents it to the priest, who kisses it, and lays it on the altar.